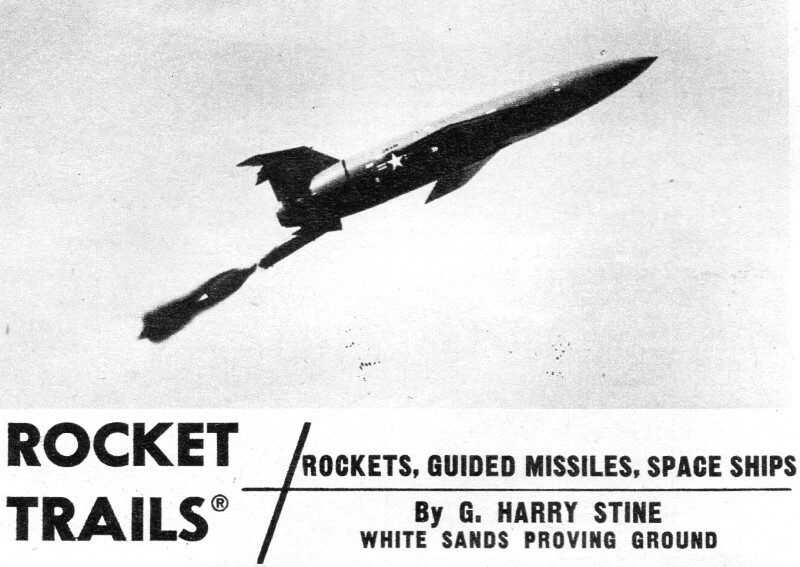 Before the Vernon Estes began selling solid propellant model rocket engines in 1958 - three years after this article appeared in Air Trails magazine - accidents were commonplace amongst backyard rocketeers. G. Harry Stine addressed the issue in many of his early "Rocket Trails" columns. I remember reading about blown off fingertips and blinded eyes in the technical publications by Estes. The National Association of Rocketry (NAR) has a report titled, "Forty Years of Model Rocketry - A Safety Report," written by Stein in 1997. Rocket Safety. Rockets have a peculiar fascination for people, both big and little rockets. It is one thing that helps keep rocket engineers happy in their work in the face of almost impossible engineering problems. And it is the thing which causes young men and boys to experiment by making their own rockets. It also causes them to lose their eyesight, their hands, or even their lives. Professional rocket men know they are working with perhaps the most dangerous of all devices; propellants used in all rockets are high explosives. They have a very strict list of safety regulations which they follow religiously: no smoking restrictions, acid-proof suits, emergency shower and eye baths, remote control devices, and the ever-ready fire hose. They have learned through hard experience not to take chances with rockets. Veteran amateur experimenters also know the danger. Many have had units explode or have been burned by peroxide. Like the professional men, they don't fear rockets, but they do exhibit a healthy respect for what can happen to a person who gets careless around them. Too many young men, however, have disregarded all caution when working with their creations. They are sorry for this later, sometimes ... but it doesn't do any good to wish for eyesight or that missing hand. The extreme danger of working with powder rockets or even the simple liquid units causes professional engineers to be somewhat hesitant in giving technical advice to amateurs who are merely interested in seeing fire come out. 1. Rockets are highly explosive. Treat them with respect. and caution at all times. 2. Propellants: Do not subject rockets to extreme heat (over 125 degrees F.) or to shock of handling. Don't mix powdered fuels on the bench without wearing a shatterproof face guard, and don't be too hasty or forceful in grinding or mixing. Don't handle any liquid rocket fuels without first checking for their toxic effects, and then use the proper protective clothing. 3. Firing: Fire rockets electrically, but be careful with this. Keep the firing leads grounded until last possible moment. Don't use dynamite caps! Make certain you are at a safe distance in case of an explosion. If you have a mis-fire, don't approach the rocket for at least four hours ... or let anyone else! 4. Flight tests: When you do shoot a rocket, do it far away from any buildings or homes. Don't shoot in a wind, and always shoot vertically or in a safe direction. Have someone stand off several hundred yards and follow the missile with a pair of binoculars to make sure it goes where intended. 5. Advice: Obtain the help of a qualified person, a science teacher who knows something about it. If you show you are really serious and willing to follow the safety rules, you will have no trouble. 6. Above all, be careful. Don't take chances! Rocket experimentation can be a lot of fun. But it must be conducted seriously. Too many - out for the thrill of it alone - cause damage which reflects ill will toward the majority of competent amateurs who are playing by the rules. Societies and Such. There are a great number of letters received at White Sands and other rocket proving grounds asking for information about rockets. Since most of the work at these places is under the wraps of security, few of them are answered for obvious reasons. Many times, the Public Information Offices forward the letters to the organized rocket societies. There are many rocket societies in the United States. Foreign countries have them too. The American Rocket Society at 500 Fifth Avenue, New York City, is the oldest rocket society in America, having been founded in 1930. While primarily a group of professional rocket men, it welcomes as associate members all those interested in rocketry and space flight. 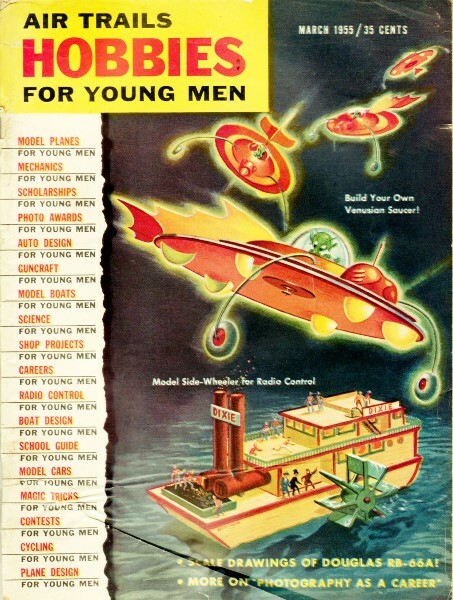 It publishes a monthly journal, "Jet Propulsion," and its sections meet regularly all over the country. On the "active" list, the Pacific Rocket Society, the Reaction Research Society, the Reaction Missile Research Society, and the Alamogordo Rocket Club are perhaps the best known of the experimental groups. They consist, for the most part, of local persons who have pooled their resources to make experimental firings and tests on small units. Every group welcomes new members, and the dues are usually reasonable. They provide a wonderful chance for both professionals and amateurs to get together at meetings and through the mails to discuss rockets. The First Space Ships. Very few people realize that the first space ships have already flown. But they haven't been called space ships. They have names like the Bell X-I, the Douglas D-558-2 "Skyrocket" and the Bell X-1A. They are space ships because they have, for all practical purposes, left the earth's atmosphere. Above 50,000 feet, 90% of the earth's atmosphere is below. And these ships have carried men in pressure cabins, been powered by rocket engines, and have been borne aloft by a primitive lower stage, a "mother ship." If they can't be considered space ships after this list of accomplishments, at least they can be termed the immediate ancestor of the space ship. It is entirely conceivable that the transition between the rocket airplane and the space ship will occur so subtly that no one will ever be able to draw a distinct line between them. Transcontinental rocket transports will probably look very much like them, for the knowledge of the aircraft and rocket fields are combined in those tiny white ships, just as they will be combined with all the other fields of human endeavor in that vehicle which will finally bear the title of "space ship." Problem: Hit the Target. One of the great problems facing missile engineers today is making the missile hit its intended target. The reason might be better understood if a person imagines what it would have been like to develop a modern DC-7 airliner without being able to put a man in it. Rockets and guided missiles are still very new; not too much is known about them. yet. They must be remotely controlled, and even the best guidance or telemetering system is no substitute for a good, observant test pilot. There are several well-known methods of guidance. Each has a function it performs best, be it surface-to-surface, surface-to-air, air-to-surface, or air-to-air. And each has its difficulties. Radar guidance systems, the type most commonly used, suffer from lack of accuracy if the radar equipment remains on the ground. Missile-borne equipment is heavy and expensive; it is uneconomical because it can be used only once. And radar systems may be vulnerable to jamming or countermeasures. The various seeker-type guidance systems are also expensive and uneconomical; they too can be confused. Present guidance systems are adequate to do the jobs we have assigned to today's missiles. But as the range of missiles increases, the problem of hitting the target increases too, just as it becomes more difficult to hit a distant target with a rifle bullet. In the next few years, engineers will be forced to come up with entirely new concepts of guidance. The problem of how to hit a target seems to be one of how to get along without a human pilot.